Think about the last time you took your daughter to the doctor. Chances are her temperature was measured with a thermometer. It would be a little awkward and unprofessional if the doctor felt her forehead with his hand. Did you know Daniel Fahrenheit’s invention was not initially embraced? A fantastic article in Scientific American by Dr. Gina Siddiqui revealed to me how doctors were loath to use the thermometer for over 100 years. For more than a century doctors dismissed the utility of the thermometer to undermine its adoption. It turns out that physicians feared new technology would make their jobs obsolete. Automation destroying jobs has worried professionals for over 300 years! Before the thermometer, a doctor’s determination of whether fever was present was qualitative. Physicians claimed their touch captured more information than any tool. Thankfully, doctors got over their collective insecurity and expectations changed. According to Dr. Siddiqui, thermometry was part of a seismic shift to what we now know as modern medicine. I believe IT asset management (ITAM), and particularly IT asset disposition (ITAD), will undergo a similar seismic shift thanks to heightened security concerns and increased compliance requirements. In the nineteenth century, medical researchers were driven by a desire to have reproducible results. Researchers demanded more than verbal descriptions from doctors. Public sentiment also began to change. Patients started to ask doctors for measurements, not to feel their skin. What does modern medicine and IT asset management have in common? Let’s look at the ITAD Gap for clues. Inventory discrepancies during the disposal phase of the IT asset lifecycle represents the ITAD Gap. Like our body temperature, the size of the ITAD Gap is a symptom of the overall health of an IT asset management program. Every business has an ITAD Gap. The bigger the gap, the greater the risk. Unlike our temperature, however, the ITAD Gap shrinks when it is measured. And if the gap is not measured, problems happen. Trusted insiders take equipment without anyone knowing. Using a thermometer previously suggested incompetence in a doctor. Today, not using one would be unprofessional. Today, every physician understands the value of quantifying temperature. Today, asset managers tend to give verbal descriptions of the ITAD Gap the same way doctors gave qualitative assessments of fever before thermometry. This “qualitative status quo” as Dr. Siddiqui described it, needs to change. Let’s hope it doesn’t take a century. As asset managers, our jobs will not be made obsolete by using tool. Using tools to measure the ITAD Gap frees us to focus on the overall health of an ITAM program. It is time to embrace tools to accurately measure the ITAD Gap. 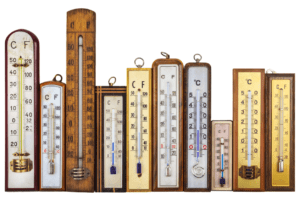 Fahrenheit’s thermometer helped usher in modern medicine. Tools like Veridy software that measure the gap automatically can free us to modernize IT asset management. To use Veridy software or learn more, call us at (888) 839-6555, or email us at [email protected], and we look forward to speaking with you.